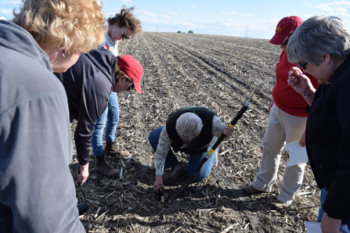 Chariton, Iowa—Agronomy in the Field is a multi-session workshop being offered to women landowners, farmers, conservationists and other women who are interested in learning more about agronomy. This series of workshops will be held monthly at the Iowa State University McNay Memorial Research and Demonstration Farm near Chariton, Iowa. The farm is located at 45249 170th Ave, Chariton, IA 50049. The goals of Agronomy in the Field are to strengthen agronomic skills for women that allow for better decision-making, provide a better understanding of inputs for crop production, see and understand different conservation practices and increase confidence in communication with spouse, farming partner, ag retailer or tenant. “We plan to cover topics on planting conditions, crop growth and development, replant considerations, weed, disease and insect identification, pest management principles, scouting techniques, forage and pasture management, and additional practices and topics as they come up,” said Vittetoe. This series is designed to be hands-on and conducted in the field to see real-time conditions. Each session will be approximately an hour and a half long; you do not need to commit for the entire season to attend. There is no charge for this series, but please register online at http://eepurl.com/cw1tA9 or by contacting Extension Field Agronomist, Rebecca Vittetoe at rka8@iastate.edu or 319-653-4811. Agronomy in the Field is sponsored by ISU Extension and Outreach in cooperation with NCR-SARE Partnership Grant Project ONC17-031. Local support is provided by Lucas, Marion, Monroe, Warren, and Wayne County Extension.